• Some branches have longer standard opening hours, including London branches except on Easter Sunday which will be 9am-4pm unless stated below. To check, click here or see pages 598-601 in the latest catalogue. 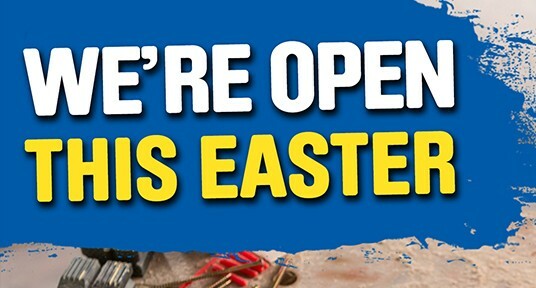 • Our branches inside Wickes are closed on Easter Sunday, with the exception of Dumfries, which is open 9am – 6pm. • Due to local regulation, some branches have restricted opening hours on particular days. ***Orders for “Saturday Delivery” on Saturday 20th April, must be completed by 8pm on Thursday 18th April. Deliveries are dependent upon prevailing weather conditions and the ability of our carriers to safely transport goods. No deliveries will be made on Good Friday or Easter Monday. Please allow additional time for items being delivered directly from the supplier. Delivery details for these items will be confirmed to you by email or by phone.